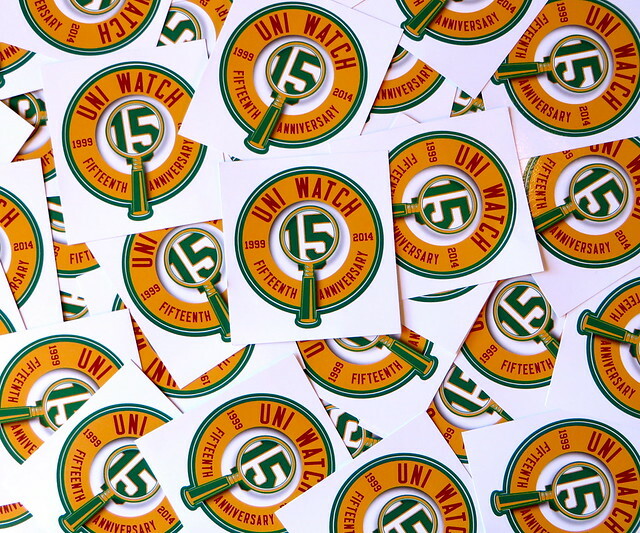 Uni Watch anniversary stickers are now sold out — sorry. You asked, I delivered: The Uni Watch 15th-anniversary logo is now available on a high-quality vinyl sticker, suitable for plastering on your laptop, your file cabinet, your car bumper, your brother’s forehead, or whatever. The circular stickers measure 2.75″ across (or 3″ if you include the little extension for the magnifying glass handle) and are priced like so: $2 for one, and an extra dollar for each additional one. To order, send a check, money order, or well-concealed cash (American funds only, please), along with a self-addressed stamped envelope, to Paul Lukas, 671 DeGraw St., Brooklyn, NY 11217. Big thanks to Ron Roza and his crew at Sticker You for doing such a nice job with these. Meanwhile: The 15th-anniversary logo is also available as a gorgeous embroidered patch and on a T-shirt. Collect ’em all, or something like that.